Choose: Girls Only! Boys Only! Have you been looking for a folder that can keep up with your kids—and help them manage their busy schedules? Then look no further! 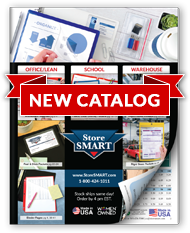 StoreSMART's bestselling Plastic School/Home Folders are made of sturdy, reinforced polypropylene plastic designed to stand up to the toughest treatment. Unlike paper folders, they won't fall apart or wrinkle in water—so you'll never have to worry about students leaving their folders outside, jumping into enticing mud puddles, or racing home through the rain. With clearly labeled sections that remind everyone which materials need to remain at home and which should be returned to class, our folders are also ideal for keeping busy students (and their families) organized. Our Plastic School/Home Folders have been manufactured in the USA for over ten years. Inferior plastic folders can fall apart within the first few days of use—but we're proud to report that some of the first folders we created are still going strong! 6-pack available in two color arrays—Girls Only and Boys Only. Outside Pockets: 8 ½" x 11" clear pockets on the front and back covers. Inside Pockets: 4 ½" clear pockets on both sides. Holds 70 sheets per side. 'School ↔ Home, Homework and Information' printed on the front cover. 'Return to School' printed in black on the inside left pocket. Help busy students remember to bring important paperwork back to school. 'Keep at Home' printed in black on the inside right pocket. Parents will be thankful for the clear instructions! Made from archival poly plastic that won't fade, wilt, or dog-ear. Design features reinforced edges and built-in "stress guards" to prevent tearing. The virtually unbreakable spine is great for heavy-duty long-term use. Spills and fingerprints wipe clean. Ink doesn't transfer. Ideal for classroom, medical, and business environments. Vivid colors help you stay organized. For folders with custom printing, click here. Show your school pride! Your school logo, motto, or both can be printed on the cover. For artwork specifications, click here. Choose from a wide variety of colors, including metallic silver and gold. We will send you pre-production samples for your approval.